CO-RET66 : 8-5-16 - FDC European Parliament "40 years 1st Concorde London - Washington"
“40 years of First Commercial Concorde Flight G-BOAC, Bristish Airways BA 579 London-Washington DC, 24.5.1976/2016"
CO-RET63CM : 8-5-16 - Card European Parliament "40. 1st flight Concorde London-Barhein"
CO-RET63 : 8-5-16 - FDC European Parliament "40. 1st flight Concorde London-Barhein"
CO-RET64CM : 8-5-16 - Card European Parliament "40. 1st flight Concorde Paris - Caracas"
CO-RET64 : 8-5-16 - FDC European Parliament "40 years 1st flight Concorde Paris - Caracas"
CO-RET65CM : 8-5-16 - Card European Parliament "40. 1st Concorde Paris - Washington"
CO-RET65 : 8-5-16 - FDC European Parliament "40 years 1st Concorde Paris - Washington"
CO-RET66CM : 8-5-16 - Card European Parliament "40. 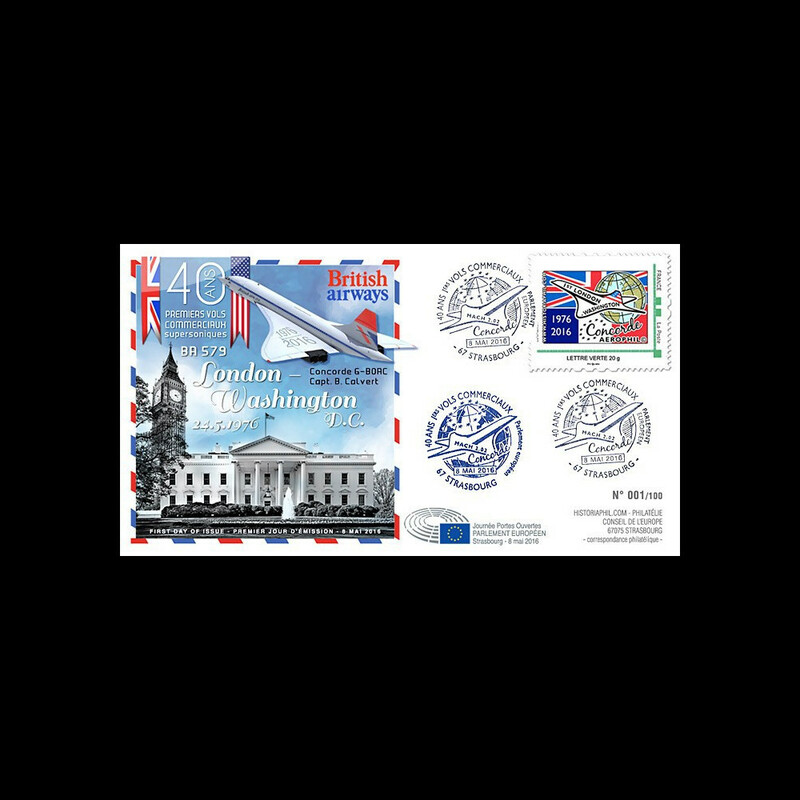 1st Concorde London - Washington"
CO-RET64V : 8-5-16 - FDC Variety European Parliament "40 years 1st Concorde Paris - Caracas"